From north: coming from Brennero on the motorway A22, take the exit Chiusa. 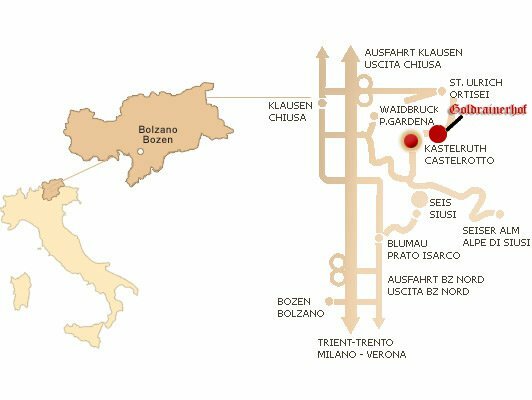 Follow the main road towards Bolzano and turn off at Ponte Gardena towards Castelrotto. This exit is only about 17 km away from Castelrotto. From south: coming from Bolzano on the motorway A22, take the exit Bolzano nord. Follow the main road towards Brennero and turn off at Prato Isarco towards Alpe di Siusi/Sciliar. This exit is only about 25 km away from Castelrotto. How to reach the Goldrainerhof in Castelrotto.